Switzerland’s new say-on-pay could make it harder for investment banking stars at UBS and Credit Suisse to out-earn their bosses. All the country’s listed companies face binding shareholder votes on executive compensation this year. But the Swiss public’s hostility towards its banks means they could be first in the firing line. The initial effect on UBS and Credit Suisse’s investment banking chiefs will be indirect. Shareholders will rule on whether executives’ 2014 bonuses are egregious in aggregate, not individually. They will also cast a vote on the base salaries slated for this group in 2016. A rejection would compel the Swiss banks’ boards to change the quantum and submit a new proposal. This rebalancing of power towards investors puts Switzerland in the vanguard on banker pay. It is also justice of a sort for Thomas Minder, the independent Swiss politician who conceived the law. Minder stormed the podium at UBS’s 2008 annual meeting in a failed attempt to get Chairman Marcel Ospel to curb compensation. Since then, Swiss banks’ divisional executives have often claimed bragging rights over their bosses. UBS investment banking chief Andrea Orcel, for instance, earned 11.4 million Swiss francs ($11.7 million) for 2013 – more than Chief Executive Sergio Ermotti. Orcel’s predecessor, Carsten Kengeter, netted the top executive payout in 2009. At Credit Suisse, meanwhile, Brazilian investment banker Antonio Quintella was the highest paid executive for 2010. He received 15.6 million Swiss francs, versus Chief Executive Brady Dougan’s 12.8 million francs. Private banking co-head Robert Shafir topped the bill in 2012. Investors holding the whip hand will make this harder in future. Swiss banks have to disclose the compensation package of their highest-paid executive. Shareholders remain sceptical of rainmakers’ ability to create more than ephemeral value, and are more focused on growing banks’ asset management arms. Outsized pay packages for investment banking heads could be rejected on sight. Could that spur investment bankers to leave? Perhaps, if investors reject payouts that are justified by performance that beats genuinely demanding targets. All too often, however, executives have too easy a ride. It is heartening, then, that investors in Swiss companies will finally be able to hold management to account. This article has been updated to make clear that the pay-disclosure requirement applies only to executives, not other employees. Chief Executive (CEO) Sergio Ermotti of Swiss bank UBS sits before an annual news conference in Zurich February 10, 2015. 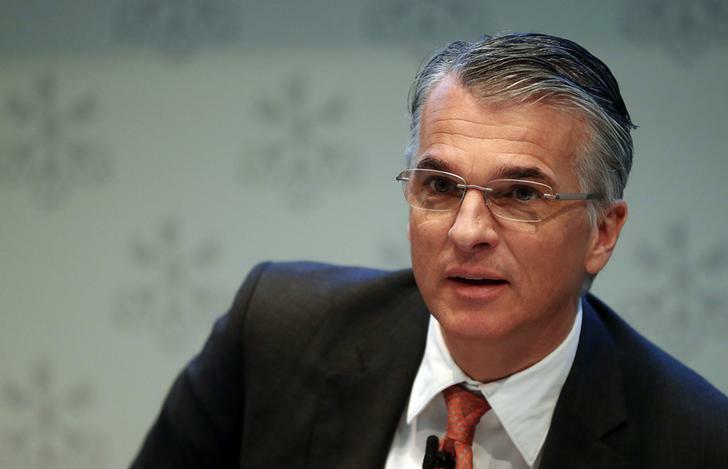 UBS said on April 1 that investors would for the first time be able to decide on compensation for members of its board of directors and group executive board at its annual shareholder meeting on May 7. Shareholders at the Swiss bank will have a binding vote on the aggregate bonus awards made to the bank’s top executives for 2014. They will also have a say on the base salaries for that group in 2016, as well as on the compensation of the board of directors for the 12 months following the annual meeting. The change sees UBS comply with the Minder initiative, which Swiss voters approved as law last year, and which forces all listed companies to allow investors a binding say on pay for their executives.